Stroke the heart of your lady love with a tender touch of your feelings for her by presenting her this Gladsome Bouquet of Startling Lilies and intensify the passion connecting you both. This Bouquet exhibits 5 stupendous Pink Lilies. Stroke the heart of your lady love with a tender touch of your feelings for her by presenting her this Gladsome Bouquet of Startling Lilies and intensify the passion connecting you both. 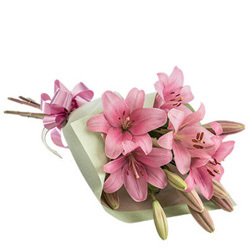 This Bouquet exhibits 5 stupendous Pink Lilies with Small Cadbury Celebration. Stroke the heart of your lady love with a tender touch of your feelings for her by presenting her this Gladsome Bouquet of Startling Lilies and intensify the passion connecting you both. This Bouquet exhibits 5 stupendous Pink Lilies with 1/2 kg Chocolate Cake.